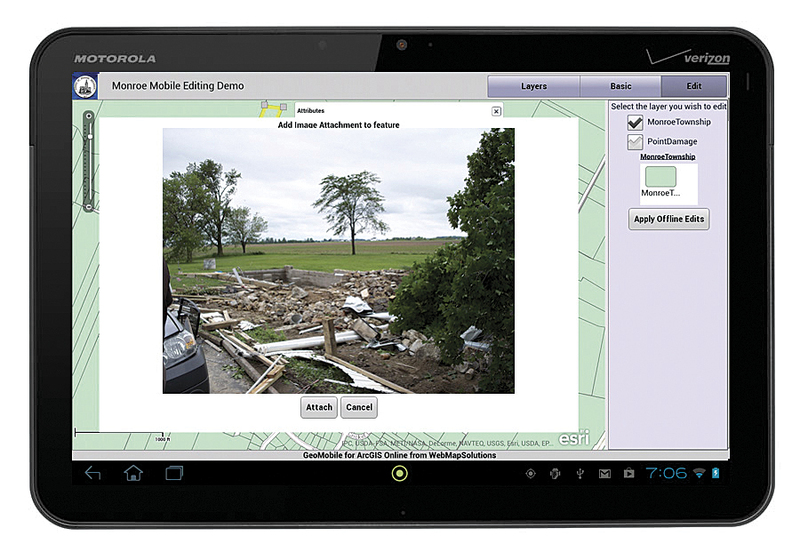 To cope with increasing demand and decreasing resources, a Michigan county is moving from a paper-based to a tablet-based system for collecting damage assessments. Response to natural disasters needs to be both rapid and carefully coordinated. Saving lives and providing shelter for those displaced are two key priorities for first responders. Assessing damage is another key task. Damage assessment measures and quantifies a disaster’s impact on the community. Jeffrey Boudrie, a GIS specialist who works in the County Planning Department for Monroe County, Michigan, performs disaster assessment. Floods and tornadoes, in particular, have become more frequent in the state over the last decade. At one time, Boudrie was one of six staff members dedicated to damage assessment. Today that number has been halved. Sometimes Monroe County has received assistance from Wayne County, its neighbor to the north. Red Cross volunteers have also helped. Though this help was welcome, it has also presented unexpected challenges. Although Red Cross volunteers receive training in damage assessment, this training differs slightly from the training state personnel receive, primarily with regard to the level of damage. Boudrie’s team assesses damage through field observation and by interviewing property owners. Data is collected on paper forms and photographs used to catalog and illustrate the extent of the damage. Teams are organized in shifts, and each team focuses on one area of an affected community. When this process is completed, the finalized data is tabulated and interpolated. This can be a very time-consuming process. Syncing up photographs with the data in the paper forms can be very challenging, especially if the person performing the data tabulation is not the same person who did the assessment. The final output from all this work is a concise report written according to the state’s guidelines. This report is provided to state officials for review and guides the final decision on disaster declaration. In early 2013, Boudrie began investigating methods for improving the county’s damage assessment processes. He discovered and began working with WebMapSolutions. 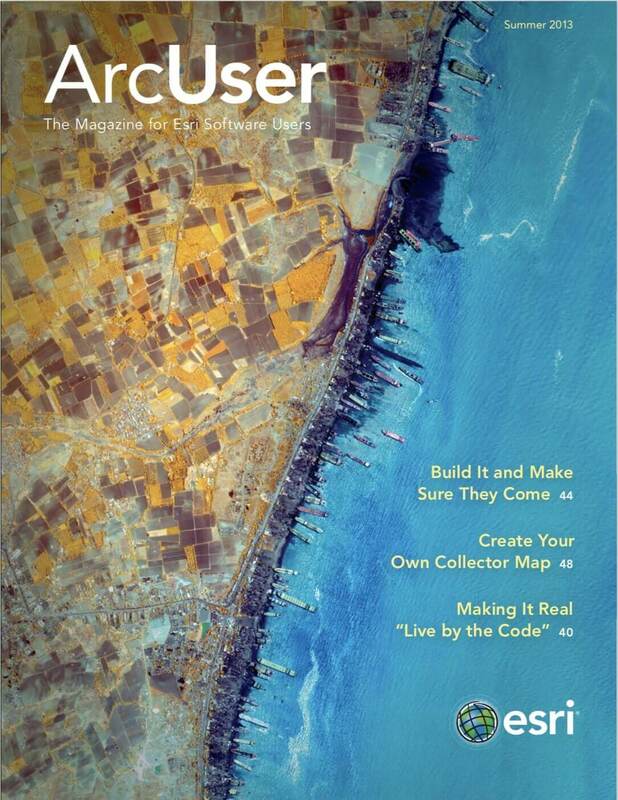 The company’s developers were already working closely with Esri on a connected/disconnected mobile editing solution based on ArcGIS Online. Esri partner WebMapSolutions is a GIS software development company based in Salt Lake City, Utah. 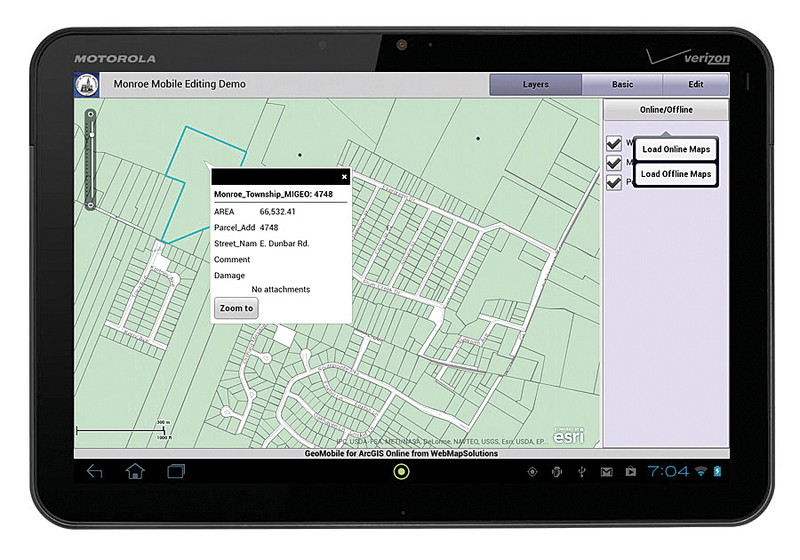 Much of the company focus is now on ArcGIS Online and mobile development. WebMapSolutions recognized the many advantages of ArcGIS Online and was an early adopter of the technology. ArcGIS Online allows for a more holistic approach to GIS, marrying web, mobile, and desktop technologies, which has allowed the company to extend its GIS client solutions. Monroe County needed to replace its paper-based process with mobile technology. Data collected needed to be stored and accessed from a single platform that would allow data analysis by GIS experts and visualization by state officials. Given the greater screen real estate available, tablets were seen as preferable to smartphones. The ideal app would be intuitive and easy to use and not require staff training. As one team finished a shift, the next team could take the same devices into the field and see where previous teams had already recorded data to avoid duplicating efforts. Team members visiting individual affected parcels should be able to tap a representation of that parcel as an overlay on the basemap in the mobile app and invoke an attribute box containing two key fields: damage level measured on a scale of 0 (damaged) to 3 (destroyed) and a comments field. The app should also let the assessor attach images to individual parcels. Because Wi-Fi or cellular access may have been destroyed by the disaster, offline capabilities would also be important. Data visualization and collection should be available in disconnected mode. Once back in Wi-Fi range, collected data can be uploaded to a map layer hosted centrally. ArcGIS Online proved the perfect platform for this work. WebMapSolutions began by publishing parcel shapefiles, supplied by Monroe County, to its ArcGIS Online account as hosted feature services. These editable feature layers were included in a single web map, the core mapping unit of ArcGIS Online. The mobile application itself was built around this web map. Time was spent up-front thinking through the interface and how to simplify workflows. Taking a single focused approach that avoided littering the app with too many tools greatly helped. Full extent, geolocation (zoom to current location), and online/offline editing were the key elements built into the app. The mobile app also reads from a configuration file on loading. This made the application highly configurable. Manufactured home communities posed an additional data collection challenge. Typically in these communities, many structures are located on a single parcel. 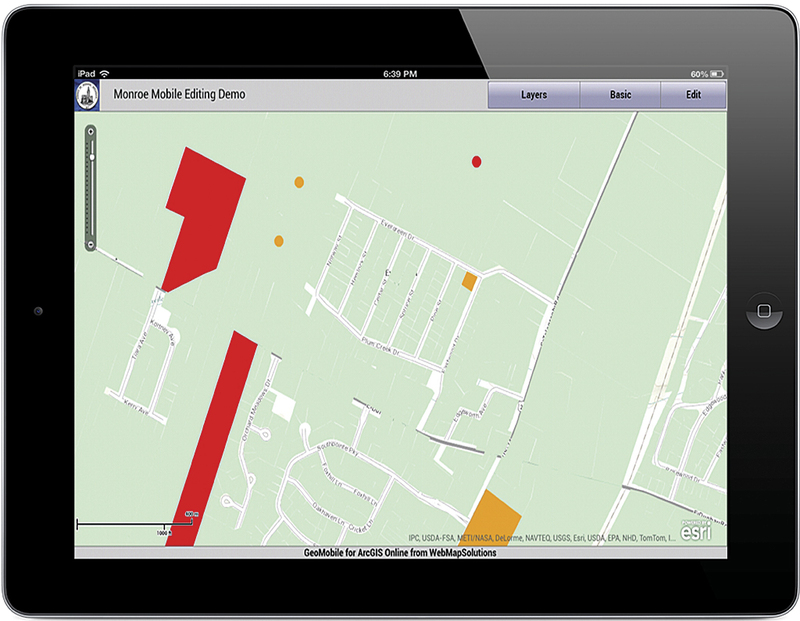 Adding a point hosted feature service allows the damage to individual mobile homes to be accurately recorded. The key to offline editing involves reading and writing data to and from the mobile device itself rather than ArcGIS Online. There are two key parts to this process. First, in ArcMap 10.1, a tile package was generated. This archive file, containing tiled images for each basemap zoom level, is copied to the tablet, either manually for Android devices or using iTunes for iPads. Next, after starting in online mode, the offline option is selected, and the feature layers are serialized or copied to the mobile device storage. In offline mode, the application only references these local layers. When it is back online, any edits—adds, attribute edits, deletions, or attachments—are uploaded to the server by selecting an Edits Upload button. For attachments, the tablet’s camera was integrated into the app. Users can, after taking a picture of a parcel, attach the image to the feature or take a new photo. An ArcGIS Online hosted feature layer can store images, video, and audio files with an individual feature, and all attachments are visible seamlessly in ArcGIS 10.1 for Desktop. By employing technologies such as Mobile Flex and PhoneGap, developers built installable apps that could be used on either an iPad or an Android tablet using just one code base. This approach potentially halves the cost of building the app as a native mobile app. These installable mobile apps can be distributed through various mobile app stores. WebMapSolutions’ work with Monroe County is ongoing, and field testing is under way. Boudrie suggested color coding the inspected parcels based on damage levels to provide a picture of not only where team members have been but the overall pattern and extent of damage to these communities. Mobile app development continues, with new features being added to the app including auto map rotation so users can reorient the tablet. The mobile app can potentially improve not only Monroe County’s responsiveness in reporting damage assessments to state officials but also its team’s workflows by improving data accuracy and making data more accessible and easily analyzed. For more information, visit Monroe County or WebMapSolutions or contact Jeffrey Boudrie or Matt Sheehan, principal at WebMapSolutions. Matt Sheehan, principal at WebMapSolutions.